Obama's got his story of rising from obscurity as a community organizer; Romney's got his story of success in the business world from humble origins. 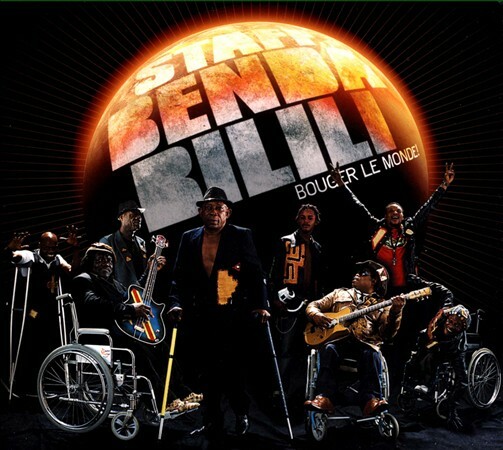 But as an inspirational story of a rise from low to high, it doesn't get much better than Staff Benda Bilili. I first wrote about this remarkable band back in 2009, when their debut album Tres Tres Fort was released, and again in 2011 when they were the subject of a documentary film. Now with the release of the new album Bouger Le Monde!, perhaps we can skip past the tales of the huge obstacles they've overcome, and just state that this is a brilliantly entertaining album. The music stands on its own; the band's back story is simply the icing on the cake. Displaying a more sophisticated sound, the songs still display the band's penchant for some odd-sounding homemade instruments. According to the band, "Bouger le monde" — "move the world" or "make the world shake"— refers to several things at once: first, their wish to modestly contribute to changing the world (through the message conveyed by their music and their attitude); second, their will to help change their own, local world; and third, their firm intention to get their audiences dancing! And #3 isn't hard to imagine as you listen to this track. from the album Bouger Le Monde! P. S. As far as I know, Staff Benda Bilili were not involved in the opening or closing ceremonies of the recently concluded 2012 Paralympic Games in London. And for that oversight, someone should be fired. Maybe a bunch of people. Because these guys are as inspirational in their field as are the blind football players are on theirs. I've been wondering about this high-pitched sound that SBB are using. It's also on the last cd before this one, Très très fort. Is it an electric guitar played high on the neck? Or some kind of traditional instrument? BTW, have a nice holiday! Excellent question, LeRoc - I believe that is the small one-stringed instrument pictured on this page: http://www.bluefat.com/1110/Benda_Bilili!.htm -- homemade, but I'm not sure if it's truly a traditional instrument. Any Congolese traditional scholars out there with the answer? Cool! I think it's some kind of tin can that they're using as a sound box? You can see Roger and Staff Benda Bilili LIVE at Town Hall Seattle's Global Rhythms on Saturday, October 27 at 8pm! Lest you think we're all totally hopeless in UK it should be pointed out that SBB performed a late-night Prom at Royal Albert Hall - supported by the excellent Baloji - during last week of Paralympics and this was broadcast live on BBC Radio 3. (If it was televised hasn't been broadcast.) Unfortunately - as with Cerys Matthews show Sunday mornings on Radio 6 - it did not get a 'world' tag on i-player so this may have escaped widespread notice.